Shaurya Chakra 2018 Winners 14 List, Names: President Ram Nath Kovind on 25th January 2018 approved 390 gallantry awards and other Defence decorations for the Armed Forces personnel and others on the 69th Republic Day. 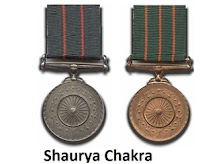 The awards include one Ashok Chakra, one Kirti Chakra, 14 Shaurya Chakras, 28 Param Vishisht Seva Medals, 4 Uttam Yudh Seva Medals, two Bar to Ati Vishisht Seva Medals, 49 Ati Vishisht Seva Medals, 10 Yudh Seva Medals, two Bar to Sena Medals (Gallantry), 86 Sena Medals (Gallantry), one Nao Sena Medal (Gallantry), three Vayu Sena Medals (Gallantry), two Bar to Sena Medals (Devotion to Duty), 38 Sena Medals (Devotion to Duty), 13 Nao Sena Medals (Devotion to Duty), 14 Vayu Sena Medals (Devotion to Duty), one Bar to Vishisht Seva Medal and 121 Vishisht Seva Medals. The Third highest peacetime decoration of India, the Shaurya Chakra, will be awarded to following 14 personnel (9 Army, 3 Airforce, 2 CRPF).